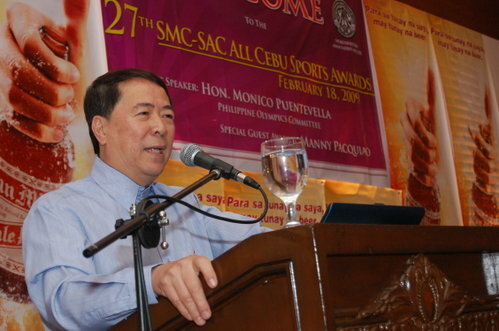 As president of the Sportswriters Association of Cebu (SAC), I was tasked to give the Closing Remarks at last Wednesday’s 27th SAC-SMC Cebu Sports Awards at the Casino Español. “To Acting Vice Mayor Jun Davide and Councilor Jack Jakosalem, thank you for joining us tonight. I promise not to talk about the Cebu City Sports Center track oval! 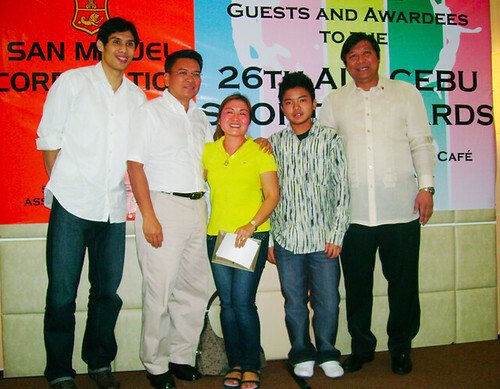 Thank you to Girlie Garces of SMC, our awards night partner for decades. “I’d like to congratulate Fr. 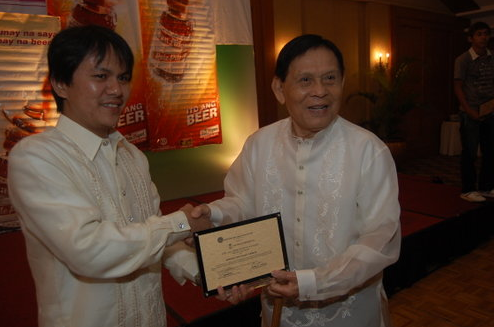 Vic Uy, the first Cebuano PSC commissioner, who is the Presidential Awardee. To my fellow Rotarian, Francis Onglatco, the Orlacsan Awardee. To Maxi Maximo, the Sportsman of the Year. To Donnie Nietes, who is represented by Michael Aldeguer. To Gerry Peñalosa, our co-Athlete of the Year… Congratulations! “I’d like to recognize Nonito and Rachel Donaire for joining us. 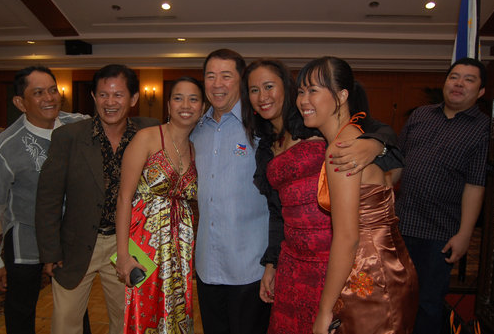 Same with the president of the Casino Español de Cebu, Manny Sainz. 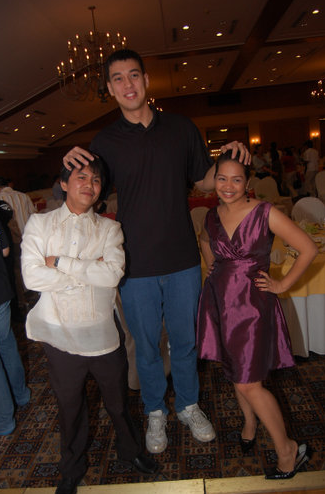 “Our Guest of Honor, Monico Puentevella, the congressman from Bacolod, maayo ni siya mag basketball kag mag-tennis. Plus, he’s an excellent singer! Maybe we can hear a duet later with Manny? “Dr. Manny Pacquiao: We’re lucky to be the first event to address him as Dr. Pacquiao. 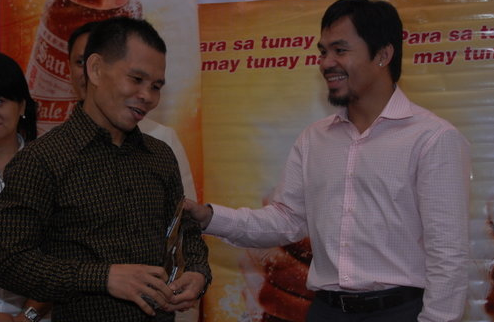 And, I’m sure next to GenSan, Manny calls Cebu home. Why? Because his father, Rosalio, comes from the southern town of Pinamungajan. Dili ra si Manny maayo mo Bisaya, naa gyud siya Cebuano roots. Thank you for accepting our Lifetime Achievement Award. Hangyo lang mi that this May 2, katong hambugero kaayo na taga England i-knockout nimo! “I’d also like to commend all the parents who are here. Without your support, example, sacrifice… your children will not be here. 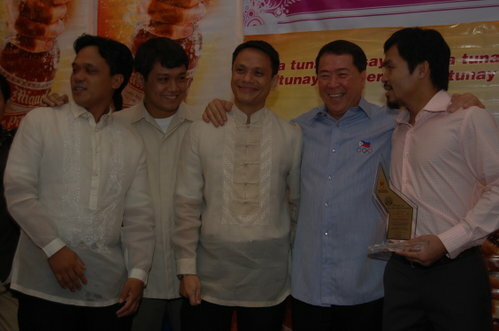 “To our awardees, congratulations! This is a memorable night. Imagine, this is the 27th Awards Night and there have been thousands of past Cebuano greats who’ve come before you… but, tonight, is your night. “Feel proud. Celebrate. Smile. 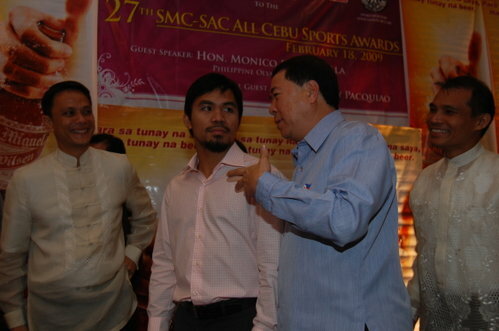 And, before the night ends, have a photo not only with Manny but with all the other athletes. THIS HAPPENS ONLY ONCE A YEAR. “Two tips I want to share with you summarized in three words: BE LIKE MANNY! “Never stop learning. Look at Manny. He’s the greatest boxer in the world. On his off days, he can be watching TV all day or relaxing at the beach… but, no, what does he do? He enrolls in college. He reads. He’s planning to become a lawyer. That’s amazing. Shows how learning and studying is so important to Manny. So I hope that we, too, will learn from this: to never stop learning, never stop improving. “Work hard. There’s no shortcut to success, especially boxing.. you’re the only one on the ring. Like my fellow sportswriters, I’ve watched Manny up-close train at Wakee Salud’s gym and you won’t believe what he goes through: the no. of hours he trains, all the beating and suffering he undergoes. I asked others if they try to follow Manny and they do… but they all get sick! Nobody can match the work ethic of MP. So, I know you all work hard but, if you want to become a world champion… you’ve got to train like MP! “To end, let me say that if you grab a newspaper today and scan through its pages, what do you see? BAD NEWS. If you look at the front page, there are murders, factory closures, Texters’ Choice fiascos… Bad news. “But, did you know that there is one section in the newspaper that is the GOOD NEWS SECTION. You know which one? It’s the sports section. And why are the sports pages the good news section? 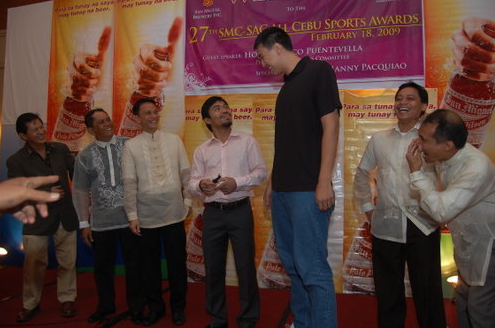 These photos from last year’s Cebu Sports Awards…. 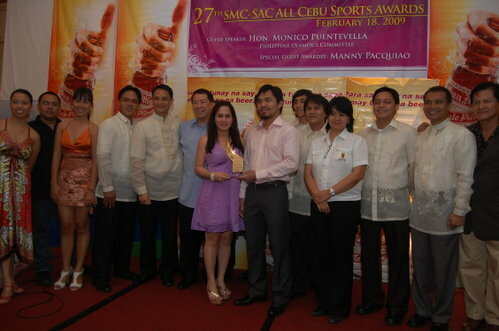 It’s “The Oscars” of Cebu sports. It’s the one evening of the year’s 365 nights when all the top athletes gather to mingle, swap stories, celebrate and be applauded. The awardees: Presidential: Z Gorres. Orlacsan: Jessica Jawad-Honoridez. Posthumous: *** Eugene De La Cerna. MAJOR: Athletics: Daniel Noval, Lindley Fran Navaja, George Pinanonang. Badminton: Ralph Ian Mendez. Basketball: M.Lhuilleir Kwarta Padala-Cebu Ninos, Woodrow Enriquez, JuneMar Fajardo, Gregory Slaughter, Mark Jayven Tallo and the University of the Visayas. Beach volley: (men) USJ-R (Ariel Carumba and Loujei Tipgos); (women) USP (Erika Camille Verano, Apple Saraum). Billiards: Rubilen Amit. Bowling: Jomar Jumapao. Boxing: Johnreil Casimero, Rodel Mayol, Donnie Nietes. Chess: Joseph Sanchez. Dancesport: DTCC, Charlea Lagaras. Golf: Irina Gabasa. Judo: Vicente Fernandez III. Karatedo: Lutche Metante, Noel Espinosa. Karting: Jette Calderon, Juan Antonio Carcel. Mixed Martial Arts: Deftac Cebu. Pencak Silat: Marniel Dimla. Running: Mendel Lopez, Mary Grace de los Santos, Leszl Gitaruelas. Sepak Takraw: Metodio Suico, Gene Mark Saavedra, Harrison Castañares, Jerome Vendiola. CITATION: Autocross: David G. Lim. Bowling: Kimberly Lao. Boxing: Milan Milendo. Baseball: Jesse Bernad. Beach volleyball: Johnrey Sasing. Football: Glenn Ramos, Christian Noel, Paolo Pascual, Carmelo Genco, Abellana National School, Oliver Colina. Mixed Martial Arts: Sabah Fadai, Renault Lao. Motocross: Siegfred Ornopia, Jon-Jon Adlawan. Running: Cebu Executive Runners Club (CERC), Dr. Potenciano Larrazabal III/Run For Sight Foundation. Sepak Takraw: Cebu Province-Sta. Fe team. Tennis: Larry Antigua, Jacob Lagman, Hannah Espinosa, Sallydine Siso, Bernardine Siso, Adrian Parangan. Volleyball: Talisay City women’s team, Catmon’s women’s team, Mandaue City men’s team, Liloan men’s team. Weightlifting: Joselito Padilla, Christopher Bureros. Wushu: Mary Stephanie Agbay. To the awardees, if you have further questions, contact me at john@pages.ph. Last week, NLQ celebrated his 20th year in sports-writing, a feat that nobody in Cebu can surpass—and very few, I’m sure, nationwide, can match. In our Sportswriters Association of Cebu (SAC) Yahoo e-groups two days ago, Nimrod was deluged with congratulatory emails from his fellow writers. The reason? Almost all of us can trace our beginnings to Nimrod. 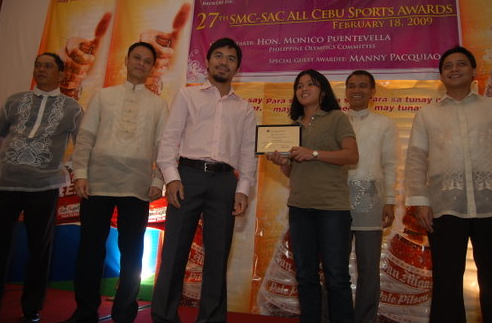 Cebu’s best and the brightest athletes mingled with the country’s most prized sporting hero, boxing champion Manny Pacquiao, in what was an unforgettable night at the 27th Sportswriters Association of Cebu-San Miguel Corporation (SAC-SMC) All-Cebu Sports Awards Wednesday evening at the Casino Espanol ballroom. If there’s one clan that I admire most here in Cebu, it’s the “J” family. Yes, every single family member is first-named J. There’s Julius, Jess, Julian, Jessica, Julie, Jacob. The “6Js” I love to call them. Three nights ago at the Madrid room of the Casino Español, the group of men and women whose stories and scores and scoops you read about each day at these back pages met. 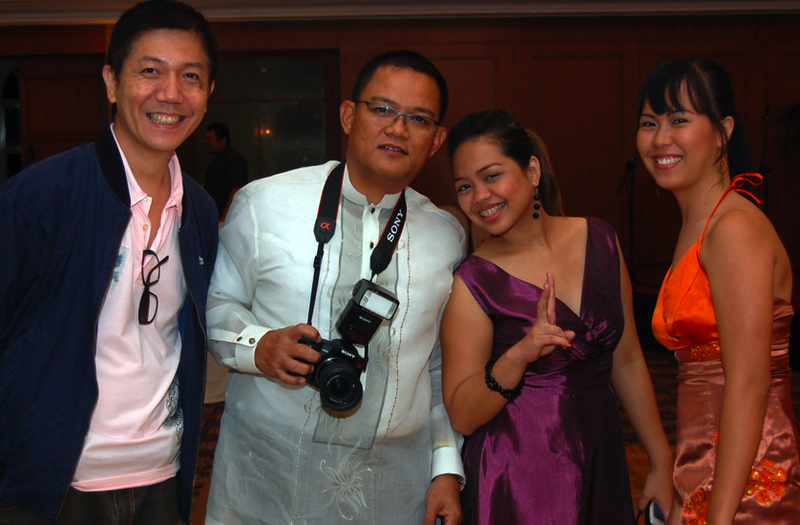 Sun.Star Cebu, The Freeman, Cebu Daily News, Sun.Star Superbalita, Banat—each of the five Cebu dailies was represented. The group? 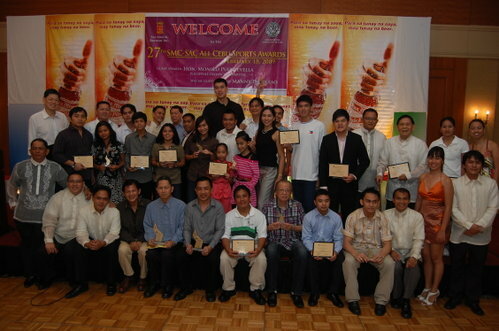 The Sportswriters Association of Cebu (SAC).